A project to develop new superpowers is underway in Academy City. That project will turn Accelerator into an...?! I'm not exactly one to write reviews, but I just HAVE to make an exception for this gem. To anyone who likes Accelerator, I HIGHLY recommend this. It does have some stupidity thrown in with all the random happenstances, but then again, this is a parody, and is for more fun than trying to "Logically Analyse". Oh, and to those who like it when a series feels like it actually "ended" well, this is a must-read. I can't describe how pleasing the ending felt, and I couldn't have written it better if I wanted to. Sure it's not "Ultra Beautiful", but if a parody looked THAT exceptional, I'm sure I would be turned off if anything. They maintain their usual Appearances from the Original series, apart from Accelerator's Idol transformations and some cover pictures. To me, who loves them all as they are, a simplistic artstyle for the most part that still maintains the charm of the original, while also being able to give off it's own charm, is Godly. The characters have mostly retained their Natures and characteristics from the Original series, which is good since for many like myself. that is what drew me in anyways(Although I won't lie I did have an undying curiosity to see how Accelerator would fare as an Idol). The original series is serious and doesn't allow for the kind of interactions this one does to take place, and this was capitalized on and executed Wonderfully. I love this fun little work, and it might be hilarious, but I love it as much as I love the original too. They're like two sides of the same coin, the Yin and the Yang. Serious, and light-hearted as hell. Both awesome in their own ways. Summary: Most of the characters you have seen in the Index series are being parodied and seen in a more humorous side instead of the more serious tone we get out of the Index series in general. 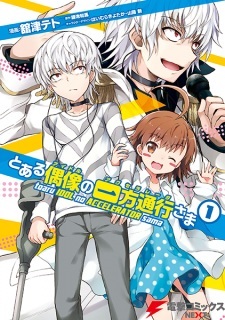 The main character is of course Accelerator, after suffering a defeat by Touma, the Academy City decides to look for a new way to turn the No 1 Level 5 Esper into the number 1 Idol. Of course he's not the only Level 5 Esper to be an Idol, in fact you'll see 6 out of the 7 city's greatest in there very own idol role also. Spoilers to people who only read the Manga or watch the anime, because this series will introduce characters you haven't been acquainted with yet, unless you read the full Novel. It's not a super recommended read, and SKIP IF YOU HAVEN'T READ INDEX AT ALL. Story (7.8): I honestly thought the story was just going to be boring at first, but it ended up being a really good read! Went from wanting to just read one chapter into catching up to the most recent chapter, and it's nice to see Accelerator and most of the characters in a more relax and comedic twist, it really does bring life into them. It's not a 8 or 9 because the story really relies on formulaic situations throughout the whole manga and it really criminal on how long a chapter releases, the same goes for any of the manga series of Index... ESPECIALLY ACCELERATOR'S OTHER OWN SERIES. ALSO TO NOTE IT'S NOT CANON TO ANY OF THE SERIES, THIS IS A PARODY OF THE MAIN/SIDE STORIES!!!!!!!!!! Art (8.0): For a side story, the art-style isn't really that bad, but don't expect Picasso like drawings in a side story of a side story of a parent story. Characters (8.4): All of the characters of this series have all been established in the main or side stories but introduced in a more different way to fit the Idol series. Some of them are parodies of their own selves like Estelle (read Toaru Kagaku no Accelerator) being a obsessive fan of Accelerator, Kuroko being Misaka's manager, and it goes on, and some of them are their usual selves, like Touma for example, being as his own old self as you usually seen before. Enjoyment (9.2): I'm a bit bias because I love the Index, Railgun and Accelerator series with a good passion, and really love the comedic and sometimes even cute side of Academy City. Overall (8.4): For everyone that loves Index or the side stories like me, then I'll definitely give this a read! A big skip for people who hate Accelerator, or just want to read a serious manga. For those who are going to read, I hope you enjoy it just as I did!